Your foot is a relatively small part of your body, but it contains close to 25 percent of all of your body's bones. Since your feet are responsible for bearing your weight and helping you move, breaking a bone can be very painful. It is important to follow your doctor's directions regarding weight-bearing after you have sustained a foot fracture. The exact placement of the break will determine how long you will be off your feet. Limit your activities for at least four weeks after you have been diagnosed with either a broken foot or a stress fracture of one of the bones. This most likely means you won't be doing any weight bearing for at least a month, unless the fracture is located in your toe, which is generally less limiting than breaking one of your metatarsals, which are the long bones in your foot. Provide your foot with ample support as you begin to bear weight. Depending on the nature of your injury, you may already be wearing a cast to immobilize your foot as the bones heal. Your doctor may also prescribe a rigid-soled fracture boot that keeps your foot in the proper position as you start walking again. 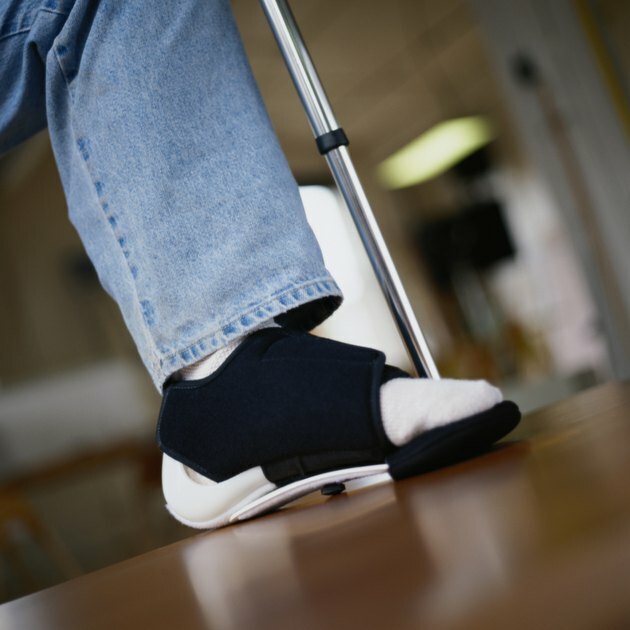 Use a mobility aid to help you get around in the early stages of weight-bearing after having a broken foot. If you have been using crutches before you are allowed to bear weight, you might now use them as a support as you experiment with the amount of weight you can bear without pain. A cane can come in handy once you are more comfortable and stable on your feet and no longer require the dual-sided support of crutches. Bear weight gradually and slowly once you are given the green light to walk independently. Your muscles have been immobile for several weeks and you will not have the same stamina or strength you had before the break. Take it easy, move slowly and have patience. With the right guidance and physical therapy, most people completely recover from a broken foot with full range of motion. With your doctor's permission, you may still be able to exercise with a broken foot, but you will need to switch to a non-weight-bearing form of workout or a sport that puts less pressure on your foot. Swimming is a non-weight-bearing activity, and biking is another lower-impact sport to consider.